In the music video for “Chewing Gum,” a 2018 song by Blood Orange, two ATVs cut across the desert, and their riders’ oversized durags—in shades of baby blue and baby pink—fly through gusty winds in slow motion like hummingbirds. Some hummingbirds, it is said, flutter their wings at up to 80 times per second; even in stillness, they move. The Reunion (2018), a piece in New York City–based artist Kevin Beasley’s new exhibition at the Whitney, “A view of a landscape,” also embraces durags, but his art holds a different relationship to movement than Blood Orange’s airborne scarves. Set in one of three eight-by-ten-foot polyurethane-resin slab sculptures, dark blue and black durags are frozen in space but nevertheless give the impression of flight as they linger over a field, like kites in the sky. Composed of materials including steel, housedresses, guinea-fowl feathers, pine cones, soil, and raw cotton from the surroundings of Beasley’s family property in Virginia (he was born in Lynchburg), Beasley’s sculptures are stiff and solid. And yet, every glimpse of these slabs reveals a tornado on pause. Picture a Jell-O salad. Picture lips pressed up against a window. On view is the flattening of an object, but Beasley’s sculptures also prompt a consideration of what is not on view by dramatizing potential openings, splays, and leaks. Thanks in part to the architecture of Renzo Piano, who designed the $422 million Whitney building with square footage that gets smaller as the building gets taller, the sculptures, located on the top gallery floor, feel like an addendum to the exhibition (which is anchored by two rooms containing sound installations). The freestanding relief trio—The Reunion, Campus, and The Acquisition (all 2018)—is the first thing you’ll see as you enter from the elevator or the stairs, and yet, they give you the sense that you have not yet arrived at the thing you are supposed to have arrived at. This might lead one to consider the sculptures marginal. And perhaps they are, but why should marginality be a bad thing? With no proverbial room of their own, the tightness or pinched quality of the sculptures’ spatial orientation is part of their draw. In the case of The Acquisition, for example, you have to contort your head in order to see the back of this wall-like sculpture, which is placed close to the gallery’s own wall. 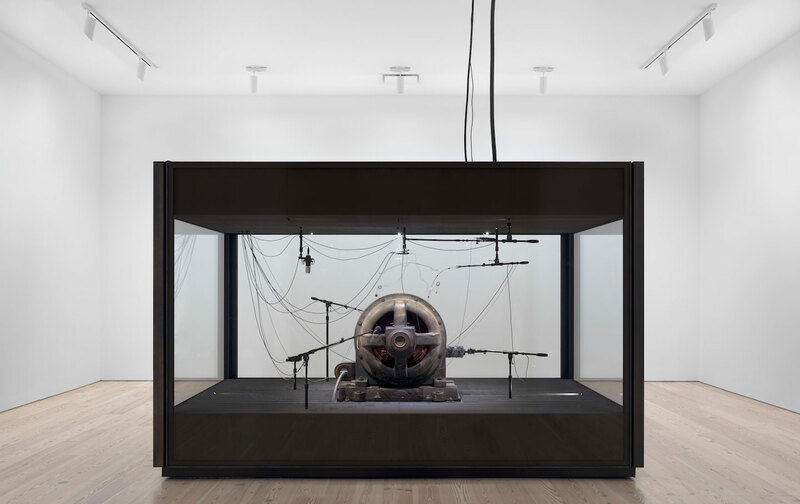 This underside, hidden from sight unless you seek it out, contains a different perspective on some of the electronic materials (a sound mixer, laptop, speaker, fan) that narrativize Beasley’s encounter with the cotton-gin motor, the hinge of the show. The motor spins and spins in one location called the chamber room. On display in a glass soundproof box with lights beaming from the bottom, the motor operates as a kind of sound system for an adjacent gallery space. The sound work, then, produces a theater of displacement: One room showcases the cotton-gin motor, which came from Maplesville, Alabama, and operated on a farm from 1940 to 1973; the adjacent space is the listening room—holding, registering, and broadcasting the sounds of the motor at various dimensions, managed by microphones, hardware, and wall paneling. Just as the sculptures blanket durags, the benches in the listening room hide subwoofers. The honor of invention carries human costs. That is to say, the cotton gin was a technological invention that sped up the production of cotton, thereby expanding slave labor in the American South. It is not lost on the exhibition’s artist and curators that the inventor of the cotton gin, Eli Whitney, shares an ancestor with the founder of this museum. In other words, the afterlife of slavery flowed into industrial capitalism, which bled into the contemporary art world. In contrast to the sculptures, where life itself might feel stuck, sound moves freely throughout Beasley’s audio work. Over the course of the exhibition, which was curated by Christopher Y. Lew, with assistance from Ambika Trasi, live performances by four artists punctuate Beasley’s use of sound: the musician and vocalist Taja Cheek, the percussionist and composer Eli Keszler, the electronic musician Jlin, and Beasley himself. Keszler held three consecutive performances at the end of January. The first show started late in the listening room, where people sat on the floor, absorbing the dizzying static of his sonic manipulation of Beasley’s cotton-gin motor under multicolored lights—Joni Mitchell blue, fire-truck red, Jolly Rancher green, Teletubbies purple. The performance itself is like a state of fugue: whirling din, full-body sensation, a pulse mediated by staccatos, shock waves, and static rain. And yet even with the din, there is a beat here, a gradual lull. Keszler’s sincerity of effort, the way he leans into his differing paces on his drum kit, gestures to how sound especially illuminates the fragmented history of our present moment that we would often rather ignore. The use of durags for warmth: a seemingly small detail with worldly implications. In recent years, durags—worn by the likes of Solange and Rihanna—have risen to veneration in fashion and popular culture (as evidenced by explainers in national newspapers and glossy magazines), even as durags are still restricted in some schools and prisons. But Beasley’s exhibition “A view of a landscape” shows us a way to look at and listen to how castoffs can be cast—that is to say, molded into an argument about how to attend to that which we cannot see. Tiana Reidis a writer and PhD candidate in English and Comparative Literature at Columbia. Her writing has appeared in The Toast, Vulture, VICE, The Paris Review, and The New Inquiry, where she is an editor.